This springtime ukiyo-e painting inspires light, feminine ensembles. ‘s Bird and Magnolia. Shōtei’s work gained international fame during the Edo period for blending Western realism with the ukiyo-e art form. Below, we’ll discuss his work and use it to inspire three warm weather outfits. was an Edo period Japanese painter. His work became well known for its blending of Western realism with the ukiyo-e style and delicate washes of paint. During this time, it was difficult for Japanese artists to travel abroad, but Shōtei successfully studied in the United States and Europe for a few years before returning to Japan. 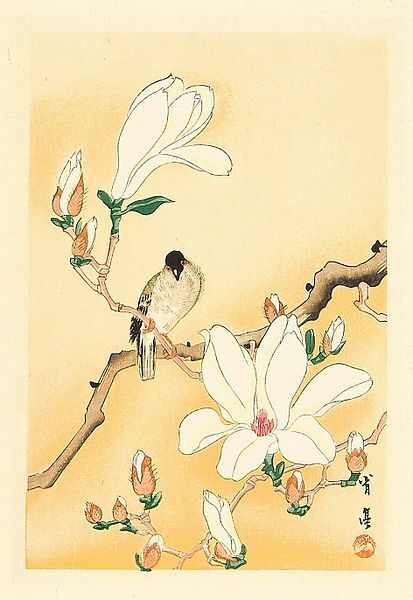 Many of his works are kachōga (bird and flower paintings). This crane printed ukiyo-e-esque patterned dress is unique and perfect for a casual day out. The bird print makes this dress a great addition to your warm weather wardrobe, as it’s different from your typical floral print. Stick with minimal accessories to avoid competing with the strong pattern of the dress. These shoes, sunglasses, and bag are all within a range of tan to peach to match Shōtei’s painting. Add some delicate gem rings for a splash of matching colors. This floral print skirt matches the watercolor texture of Shōtei’s paintings. 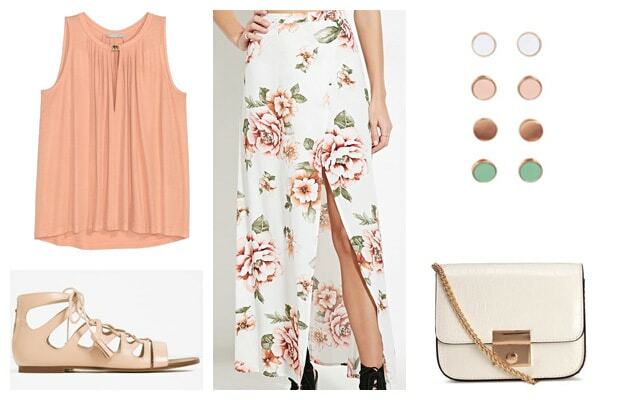 Tuck in this flowy peach-colored top for a full spring outfit. Add some matching earrings, some cute sandals, and a minimal white purse. This final outfit is inspired by the calming vibes of Bird and Magnolia. This long textured kimono is a neutral color that would look great with a variety of outfits. Pair it with this simple white dress. This cute bangle features charms of a bird, heart, and tassel that are sweet outfit additions. Finally, add some heeled sandals for a little extra elegance. Have you seen other ukiyo-e paintings? What do you think of Watanabe Shōtei? Which outfit above is your favorite? Leave your comments and feedback down below.